Oriental Spirit is one of a number of excellent Thai restaurants in the Hoddle street end of Victoria Street, Richmond. This area contains one of the highest concentrations of Thai restaurants in Melbourne and is a must visit for any foodie who takes their Thai food seriously. If you use a bit of imagination this stretch of Victoria Street could be any of the Sois off Sukhumvit Road in Bangkok. Only the frequent tram’s constantly rumbling past remind you that you are still in glorious Melbourne. Before opening Oriental Spirit over 7 years ago, owner and chef Krisada ran his own restaurant back in the Isan region capital of Chiang Mai in northern Thailand. 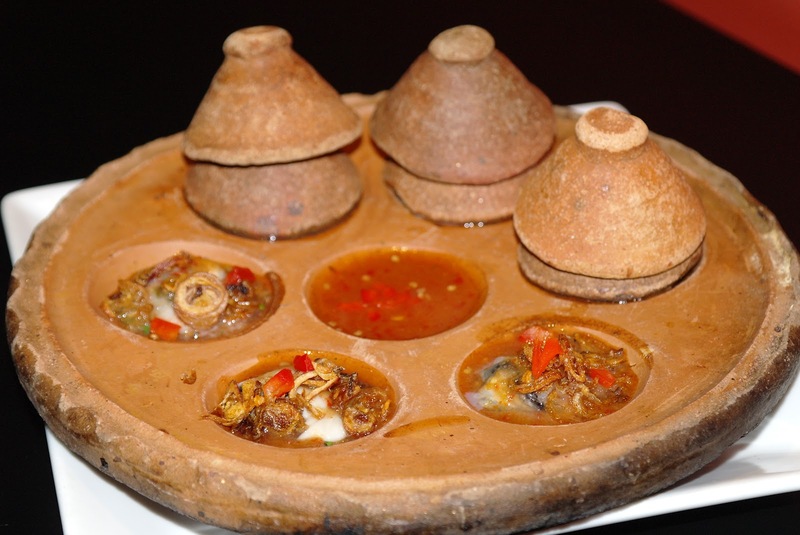 Although Oriental Spirit specialises in Thai cuisine, khun Krisada also offers an interesting selection of non-Thai dishes including Curry Laksa, Peking Duck and Fish Chilli Sambal. That said, it is his Thai offerings that he is most proud of. For our visit he recommended a delightful selection of dishes starting with Oysters with Lemongrass which is his take on Modern Thai cuisine, a cooking style that I broadly define as a blend of western food styling and traditional Thai flavours and cooking techniques. The Oysters in Lemongrass are an excellent showcase of chef Krisada’s interpretation of these cultural combinations, served in a traditional clay kanom krok cooking implement, the immaculate presentation would not be out of place at any of Melbourne’s high end south east asian restaurants. The oysters are served partially heated leaving them not quite raw and not quite cooked. I found this quite an interesting decision however I felt that the subtle heating assisted to bring out the flavour of the wonderfully spicy sweet lemongrass and ginger scented sauce in which they were served. The sweetness was offset nicely by the saltiness of the oysters and the accompanying kick of chilli gave a casual (and I suspect unintentional) hat tip to an oyster bloody mary. The next dish to arrive was the beautifully presented Pineapple Fried Rice (khao pad siparot). 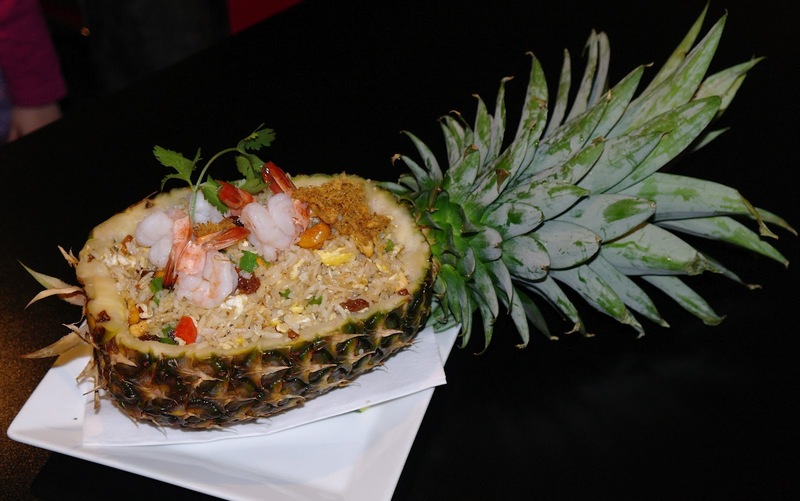 The presentation of this dish will be familiar to most who have visited Thailand, a hollowed out pineapple stuffed full of sumptuous fried rice with sweet chunks of pineapple. On feasting my eyes on this wonderful creation I was immediately scouring the table for my pina colada! Khao pad is a staple for the Thai however most will not take their daily dose of khao pad presented with such splendour. Aside from the presentation, this flashed up version of khao pad definitely delivers on taste with juicy whole king prawns and moist pieces of chicken thighs providing the substance to partner the gorgeously wok smoky fried rice. Khun Krisada’s version of khao pad is not particularly spicy but rather more on the sweet side thanks to the addition of sultanas and of course pineapple. The use of lovely nutty salty cashews, sweet shredded pork and crunchy textural snake beans make this version of fried rice unmistakably Thai. In additional to providing visual appeal, the pineapple also serves as a very functional serving vessel that seemed to have no end. I found this dish deceptively large and had to return to it a number of times until I finally caught a few glimpses of pineapple flesh beneath the rice that indicated the end was nigh. Our final dish for the evening (or so we thought) was the one that we were most excited about, Crispy Papaya Salad (som tum thod). Som tum is definitely as Isan specialty and it is very common in Bangkok to see groups of construction workers from the north enjoying fierily hot bowls of this for their lunch. Aside from it being a traditional favourite of the Isan people its inexpensiveness makes it very accessible to the lower income workers. Street food vendors who serve som tum will almost always also sell grilled chicken (gai yang) and those with means will eat the two together while those without receive their protein from the dried shrimps that add a contrasting chewy texture to the crunchy shredded green papaya. I love a good som tum as much as the next person but what got me salivating in excitement was chef Krisada’s version of this traditional Isan dish. The word ‘thod’ in Thai means fried which confused me a bit at first as I though that ‘pad’ meant fried as in khao pad where khao is rice and pad is fried. I’m still not completely sure but I have decided that pad is for food that is wok fried and thod for food fried in any other cooking implement. In the thod version of som tum the shredded green papaya and carrot is deep fried to achieve a wonderfully crisp crunchy texture and divine flavour that is even further enhanced by the zesty, sweet and very spicy dressing. Thai chefs guard their dressing recipes very zealously and I was unable to pry much information from khun Krisada as to its construction. My palate detected lime juice, palm sugar and fish sauce but there’s no great revelation there as these three ingredients are used in almost all Thai dressings and dipping sauces. Earthy peanuts, acidic tomatoes, chewy dried shrimps and spicy chillies added further complexity to this very special variant of som tum. Perhaps our host felt our excitement for his efforts or perhaps he was just feeling generous as even though our appetites were well and truly satiated he brought forward one last wonderful creation from his kitchen. 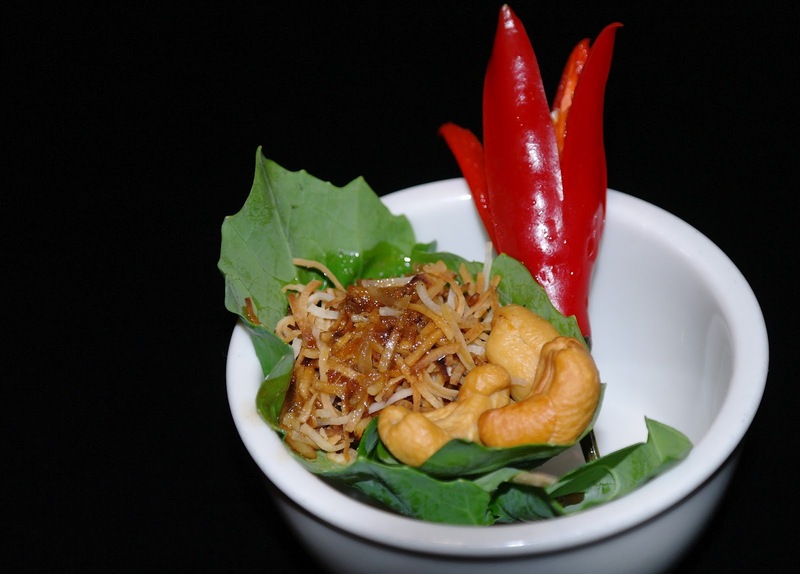 The Oriental Spirit menu lists this magnificent snack as Thai Bitter Leaf (miang kham). Typically in my experience a betel leaf is used for wrapping up the contents of this little parcel of goodness. The Oriental Spirit version uses a pak kana (Chinese broccoli) leaf, which I felt was an interesting variation. In any case, the wrapping is merely a support act for the symphony of flavour and texture contained within its folds. The myriad of ingredients make identifying any individual element very difficult however chef Krisada very kindly informed me that I was enjoying a blend of galangal, ginger, palm sugar, chilli, lime, shallots, cashews, toasted shredded coconut, chilli and a sublime sticky sweet sauce of gapi (shrimp paste), tamarind, sugar and I’m sure a few more secret ingredients. While I had noticed Oriental Spirit on previous visits to Richmond I hadn’t identified it as a Thai restaurant, perhaps that’s due to the name Oriental Spirit which doesn’t leap out at you as sounding particularly Thai or maybe its just that I’m not very observant. I’m sometimes a bit averse to restaurants that try and combine multiple cuisines. Personally, I preference specialisation over diversification. In saying that, Oriental Spirit has given me cause to reassess. I’m still not sure it would be my choice if I had a craving for Laksa but after meeting khun Krisada and tasting some of his food I am comfortable recommending Oriental Spirit to those wanting to try a modern take on Thai cuisine without the high prices of some of the high end CBD southeast asian restaurants. This review was conducted in my capacity as restaurant reviewer for ‘Thailiciouz’. I dined as a guest of the restaurant who knew in advance that I would be dining there, and selected the dishes they wanted to showcase. 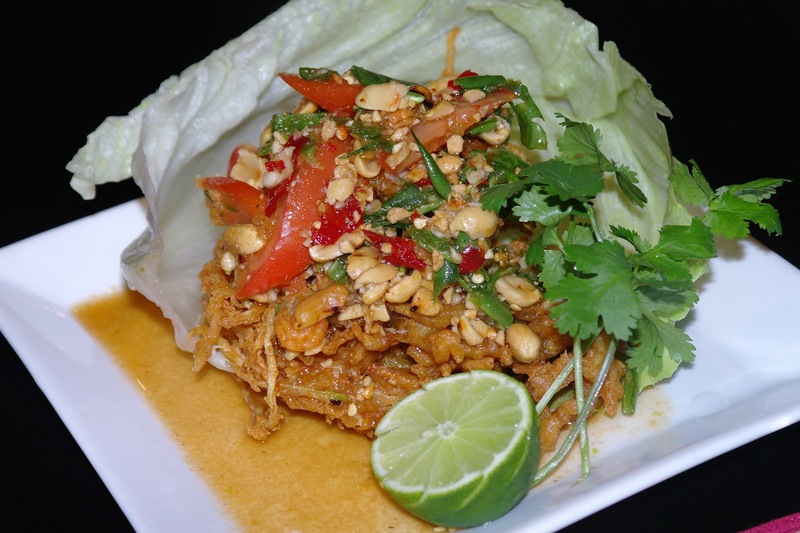 This review is reproduced on www.thailiciouz.com.au. Please visit the ‘Thailiciouz’ website for information on how you can receive hot deals from various Thai eateries, massage parlours and other contemporary Thai businesses. Fab review! I have massive food envy right now, definitely going to check this place out soon! Thankyou Bish, great interesting food makes writing reviews feel very easy! Good to hear a voice of some experience praise Thai food in Melbourne. I often wonder how our Thai eats places compare in terms of goodiness to the various Viet precincts, for instance. Any other concentrations of Thai places in Melbourne? I believe there's some fine joints in the west, but they're scattered! Thankyou for the kind comments Kenny. Its an interesting angle you raise on the Thai and Viet comparison, something for me to think about for future posts. The other great concentration of Thai restaurants is of course Springvale but I'm sure the west has some wonderful surprises to reveal. I love the idea that there are so many more great restaurants out there yet to be discovered! 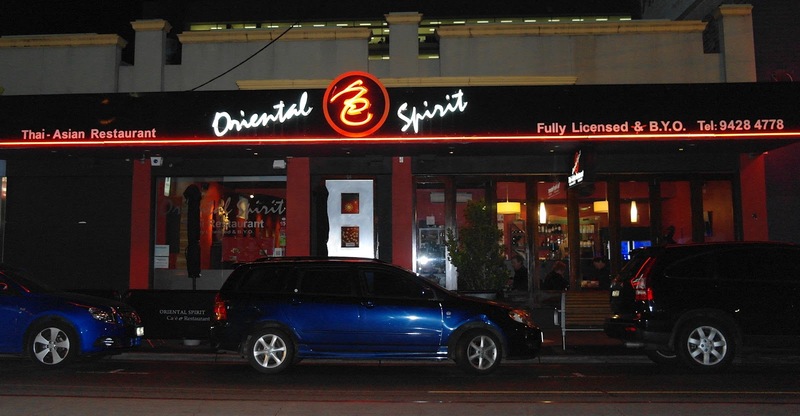 I've wandered by Oriental spirit in the past but never appreciated it was actually a Thai restaurant. The Oysters in Lemongrass looks very much like Jimmy Shu's signature dish that still feature at his 'Hanuman' restaurants in Darwin, Alice Springs & Cairns. Keen to try the Oriental Spirit version, so may have to get myself down there. Can't say I've ever come across fried som tum, very interesting indeed. Thanks for highlighting another unique restaurant to add onto my lengthy wish list. Nat I had the exact same experience, it's funny how you develop an almost subconscious idea of what to expect from a restaurant from its exterior. I thought I had a pretty good idea about the Thai restaurants on Victoria street but have been surprised to find some really good new places recently. I checked out Jimmy Shu's Hanuman oysters and you're right, they look almost identical. I would love to be able to do a taste comparison but don't get up that far north ever really. I'm sure he has a definite advantage when it comes to sourcing fresh Thai ingredients given the similar climate. The som tum thod was new to me too, I love these little known but still traditional variations on classic Thai meals. Another dish in the same vein that I learned of recently (thanks once again to She Simmers) is green papaya pad thai. I'll be keeping my nose to the ground to try and sniff this one out in Melbourne.